Are you always looking for new ideas on how to to use headwear in your branding and promotional or recognition events? We call ‘em Thinking Caps and if you’re like most, you wear yours 24/7. The right idea can help you with all the different hats you may be wearing these days. Read on for a bit of history as well as what’s new in baseball caps. In the 1960’s and 70’s, promotional hats were widely used by feed stores, farm equipment suppliers and automotive businesses who began giving away plastic mesh hats with snapbacks and foam fronts. The inexpensive “truckers caps” or “gimme caps” caught on especially in rural America. According to Lilliefors, “John Deere cap sales increased by 40% a year in the mid ‘70s.” Entering the 1980’s, Tom Selleck’s signature Detroit Tigers baseball cap worn in the TV Series Magnum P.I. further engaged larger audiences and popularized their use. The ball cap style most popular continues to be the basic unstructured model, featuring a fabric strap closure, mid profile with the logo or message positioned front and center. When Golf is your game, as the weather changes you may seek out one of the Gore-Tex bucket hats available from lines such as Callaway. This bucket rain hat is an essential element of any golf strategy. Features include Gore-Tex fabric with wide brim to shed rain, seam taped for waterproof performance and adjustable fit. If it feels like you are the only one wearing the Thinking Cap and you could use help with ideas to promote your brand, products or services, contact us for an appointment and we’ll bring you your very own Thinking Cap strong as reminder that we wear ours 24/7 to bring you the right ideas. Each month we find unique and timely products that we offer for a limited time to provide our clients with the opportunity to try something new. Come BACK here to see what's new each month. Sticky notes to remind someone to bring home their lunch box! Or for your business - 25 mini billboards. 3x3 full color included! 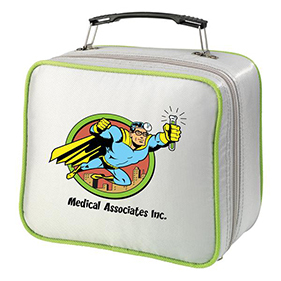 This padded lunch cooler takes design cues from the metal lunch boxes of the 50's & 60's that started it all. Features a diamond weave exterior, PEVA-insulated easy-clean interior with internal mesh pockets & plastic handle. This rugged lunch pail features two PEVA-insulated compartments. 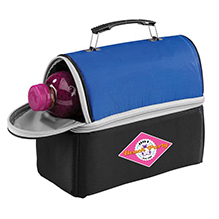 The top compartment holds beverage bottles up to 20 oz. in size and bottom easily holds lunch. Give customers or employees a premium performance product! 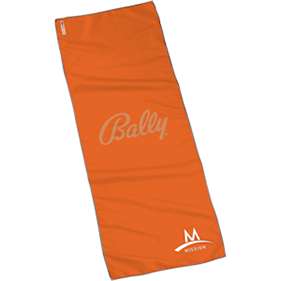 These COOL towels use a proprietary technology to provide instant cooling relief after coming into contact with any moisture, like water or sweat. Eduracool towels are machine washable, fully reusable, and are the go-to cooling solution for professional athletes in a wide range of sports. 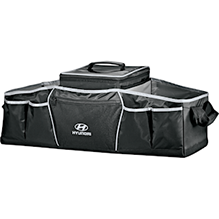 The CarGo cooler takes the traditional trunk organizer and adds an extra twist - a removable cooler! It's great for road trips, transporting groceries, tailgating, and for picnics. It is a functional item with wide appeal that works well as a great premium for new customers, employee incentive, or as a co-op marketing effort.